Crescent Beach is located in the heart of North Myrtle Beach, along South Ocean Boulevard, Crescent Sands at Crescent Beach offers a quieter and more secluded location, yet it is also a short walk to a great array of restaurants, shopping and family attractions. 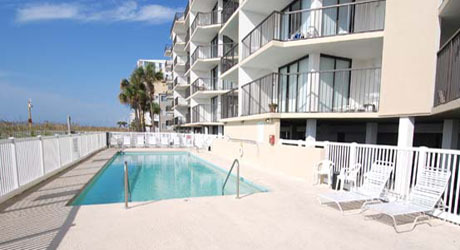 The accommodations of Crescent Sands at Crescent Beach are comfortable and handsome, and all condominium units feature26-foot oceanfront balconies for spectacular views of the wide, white-sand beaches of Myrtle Beach. 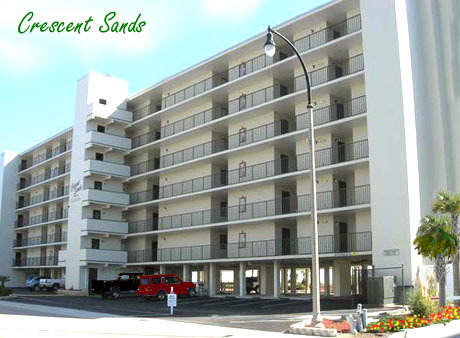 Read more about Crescent Sands real estate. Crescent Sands offers two and three-bedroom condominiums; the-two bedroom condos boast approximately 1,100 square feet of living space and the three-bedroom condos boast approximately 1,350 square feet of living space. Each oceanfront living room and master bedroom in Crescent Sands at Crescent Beach offers sliding glass doors which lead out onto an expansive, private balcony. Sunset views over the Atlantic have never looked so fine! 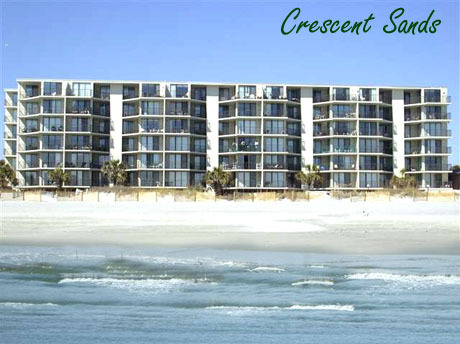 The relaxation, comfortable accommodations, spectacular, oceanfront location and fine amenities make Crescent Sands at Crescent Beach an ideal investment opportunity for Myrtle Beach real estate.